Ukrainian Orthodox Church of the USA - Ordination to Deaconate at St. Sophia Seminary! Ordination to Deaconate at St. Sophia Seminary! On the Feast Day of the Holy Spirit—Monday, June 4th—a wonderful event took place in the life of St. Sophia Ukrainian Orthodox Theological Seminary in South Bound Brook, NJ. Faithful of our Holy Ukrainian Orthodox Church of the USA gathered together at the Three Hierarchs Chapelof the Seminary to witness the ordination of seminarian Subdeacon Vasyl Dovgan to Deaconate. The Hierarchical Divine Liturgy was celebrated by His Grace Bishop Daniel, the Ruling Hierarch of the Western Eparchy of the UOC of the USA and the Dean of Students of the Seminary, with the presence of His Eminence Archbishop Anthony, the Locum Tenens of the Church, along with a number of clergy from the surrounding NY/NJ/PA. Responses were sung by the student body of St. Sophia Seminary along with members of the St. Andrew’s Ukrainian Orthodox Memorial Church choir, under the leadership of Maestro Michael Andrec. 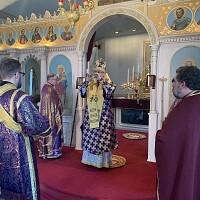 At the beginning of the liturgical service, His Grace Bishop Daniel was greeted by the provost of the seminary, Very Reverend Bazyl Zawierucha, who also serves as a pastor of Holy Dormition Ukrainian Orthodox parish family in Northampton, PA. Monday's feast day, the Day of the Holy Spirit, which follows Pentecost—the “birthday” of our Church, served as a fitting day to welcome a new member of our clergy. The Epistle reading during the liturgy was taken from the letter of the Holy Apostle Paul's Letter to Timothy, in which he addresses deacons of the church. 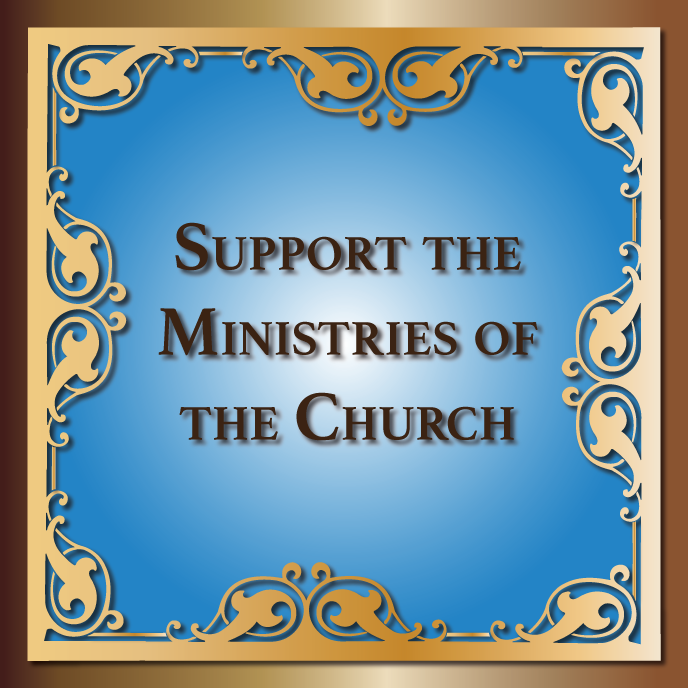 In his letter he says: "deacons must be reverent, not double-tongued, not given to much wine, not greedy for money, holding the ministry of the faith with a pure conscience...let these also first be proved then let them serve as deacons being found blameless". 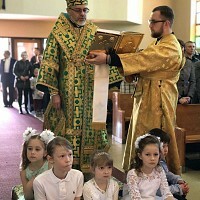 The journey to Monday's ordination began years ago when seminarian Vasyl began his theological studies in Ukraine. Five years ago, Vasyl joined the seminary in South Bound Brook, NJ where his studies continually brought him closer to being found worthy of the Deaconate, as was written in St. Paul's letter. Bishop Daniel, in his sermon, also reflected on Vasyl’s personal journey to Monday's celebration. As St. Paul spoke of the qualities of the deacon, he did not neglect to mention their wives; as Vasyl prepared himself for this day, his wife Ilona stood faithfully beside him supporting him: "...likewise their wives must be reverent, not slanderers, sober, faithful in all things". As Deacon Mychail Sawarynski exclaimed: “Command!”, Subdeacon Vasyl was brought forth by his fellow classmates seminarians Subdeacons Vasyl Pasakas and Andriy Matlak. Bowing down before Christ three times, Vasyl humbly presented himself before Bishop Daniel for the laying on of the hands. Through the laying on of hands and the prayers of ordination, the same Grace of the Holy Spirit came upon him as it did on the day of Pentecost in the presence of the Apostles. In unison, the congregation too found Deacon Vasyl worthy, repeating after the bishop and the clergy: Axios! The liturgy concluded with greetings from His Grace Bishop Daniel, as the newly ordained Deacon Vasyl addressed the faithful and clergy present. The new deacon was grateful to his ordaining bishop that through the laying of the hands, he now follows the Apostolic Succession, and can now participate in the same Priesthood as his departed father who once wanted to witness his son serving alongside in the altar. Deacon Vasyl offered his prayerful gratitude to Bishop Daniel for his parental guidance throughout the years of theological training and with tears in his eyes promised to serve the Lord, being humbly obedient to the guidance of his ordaining bishop. After the liturgy, the clergy and guests were able to greet the newly ordained deacon and his wife during a luncheon prepared at the Seminary. His fellow classmates had the opportunity to greet the newly ordained Deacon Vasyl with prayers for all the virtues needed to serve in Christ’s Holy Vineyard. Archpastoral Visit to Upstate New York! Liturgical Commission of the Church Meets at the Metropolia Center!